2007 Hummer H3 Air Conditioning System Wiring Diagrams. 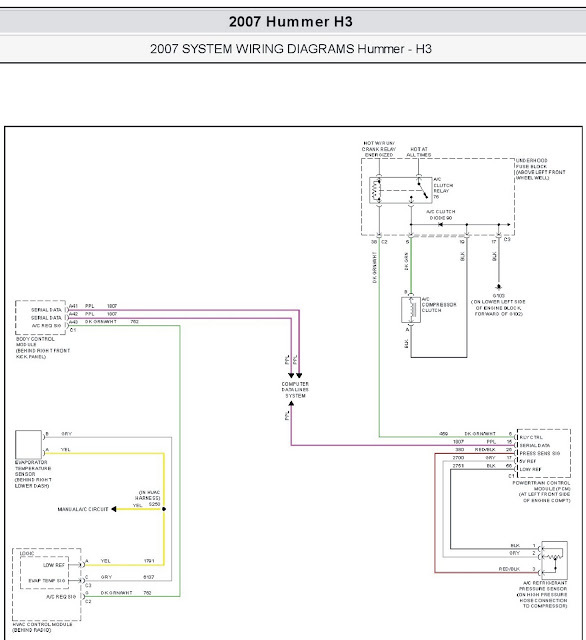 This schematic wiring diagram shows the parts of the 2007 Hummer H3 Air Conditioning System Wiring Diagrams. The parts shown here includes: A/C clutch relay, A/C clutch diode, underhood fuse block, A/C compressor clutch, body control module, evaporator temperature sensor, powertrain control module, HVAC control module, A/C refrigerant pressure sensor. This schematic wiring diagram is drawn in color, so it is easy for you to determine each wire. Be sure to understand the parts and the color codes to minimize the probable of doing failures and mistakes. Enjoy your work and get the best result. The image below will show you the detail of the 2007 Hummer H3 Air Conditioning System Wiring Diagrams (click on image to enlarge).